The 2015 VW Passat is an American-built mid-size sedan with the amenities and space of many full-size models, with best-in-class, stretch-out rear-seat legroom and trunk space to match. The Passat TDI® version—the only clean diesel option in the segment—delivers an EPA estimated 44 miles per gallon on the highway with the manual transmission, giving a range of almost 814 miles. The previous-generation diesel engine, matched to a six-speed manual transmission, and driven using special, highly efficient driving techniques and tires, set a new GUINNESS WORLD RECORDS® achievement for the “lowest fuel consumption—48 U.S. states for a non-hybrid car” category with a stellar 77.99 mpg—more than 10 mpg better than the previous mark of 67.9 mpg. Headlining the Passat’s changes for 2015 is a new 2.0-liter four-cylinder engine TDI Clean Diesel engine that produces 150 horsepower and carries the designation EA288. This engine is also more fuel-efficient than the previous version; when paired with a manual transmission, it returns an EPA estimated fuel economy figure of 30 in the city and 44 on the highway (an improvement of 1 mpg, respectively), while the six-speed DSG® automatic now returns 42 mpg on the highway (a 2 mpg improvement). The Passat’s clean design, with a predominance of horizontal body elements, reinforces the Passat’s position as the sophisticated choice in the mid-size segment. The Passat’s front end displays the horizontal brand face, with the three-blade grille and headlights forming a single unit. The Passat’s grille is sculpted in a three-dimensional shape and makes a distinctive and elegant impression because of its strict geometry. Beneath the front bumper is a large, lower intake with a striking honeycomb surface and available foglights housed at each end. To emphasize the aerodynamic styling of the Passat, the roof lines flow toward the back with a nearly coupe-like cut of the rear window. Three side windows create luxury-class style with a long, extended glass surface. The lines of the taillights rise toward the sides, underscoring the dynamics of the elegant rear styling. Another unique feature here is the design of the two-part taillights that are integrated in the rear fender and trunk lid. This is a generously-proportioned four-door sedan and the largest Passat ever. Nose to tail it measures 191.6 inches and features a stretched 110.4-inch wheelbase and 72.2-inch width, which allows such exceptional rear seat space. The Sport model offers two unique color combinations that differentiate it from the Passat family. When clad in Candy White, the Sport is outfitted with a black roof and mirror caps, while the second color offered on the Sport—Urano Gray—is exclusive to this trim. Designed and specifically tailored for the U.S. market, the Passat delivers plenty of space for five adults to comfortably stretch out. Ingress and egress is made effortless with the large, wide-opening doors. The instrument panel is similar to that of Volkswagen’s flagship model, the Touareg. Available chrome-trimmed gauges surround a digital multifunction display. A high-end chrome look is also applied to the air vents in the cockpit, and to the surrounds of the radio, navigation system, and the climate control panels. The rotary light switch and parking brake handle button are also treated in chrome. The seats are exceptionally comfortable, with an emphasis on providing extra thigh support for long-distance road trips. Even in the base version, the driver’s seat adjusts eight ways, including lumbar, while most models feature eight-way power adjustment. Inviting cloth trim is offered with the base S model, while the Wolfsburg and higher trims feature Volkswagen’s characteristic perforated V-Tex leatherette seating surfaces. Two-tone seating is offered on SE models, and SEL models move up to leather seating surfaces. All trims, with the exception of the base S model, receive VW Car-Net® connected services, and rearview cameras are available across the lineup. Sport trims are distinguished with comfort sport seats, carbon-look trim accents, aluminum sport pedals, paddle shifters (automatic transmission only), stainless steel door sills, and Sport-specific floor mats. There is no shortage of entertainment system options with the Passat—but the most exciting is the Fender® Premium Audio System, which was designed to bring the raw emotion of a live music performance to the driving experience. And the same cool, chromed Fender logo that has graced the guitar “amps” of some of the world’s music legends is featured on the Passat’s Fender system. The 2015 Passat lineup features three engine options, including a powerful 3.6-liter VR6®, the 1.8-liter TSI® turbocharged four cylinder, and the new EA288 2.0-liter TDI Clean Diesel. 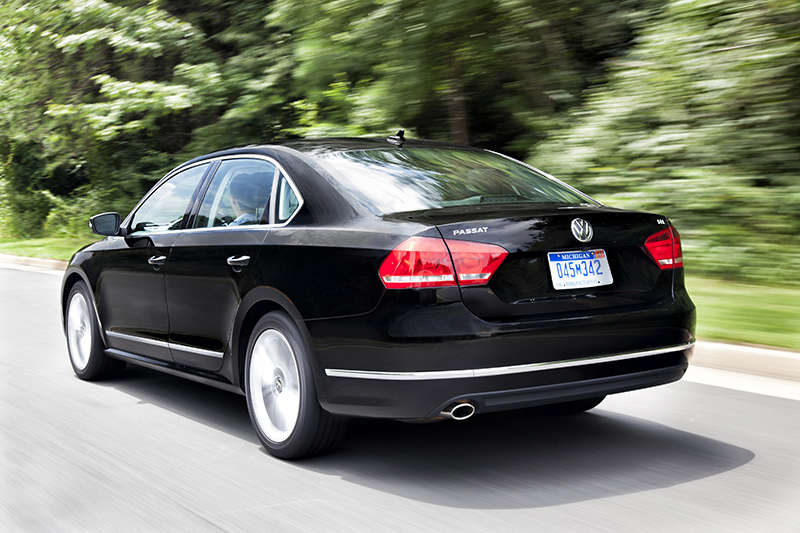 The 3.6 liter VR6 makes the 2015 Passat a top-flight sport sedan. Producing an impressive 280 hp and 258 lb-ft of torque, it offers power and luxury-class driving comfort, with European-type restraint in its fuel consumption—the EPA highway estimate is 28 mpg. Shifting on the Passat VR6 model is handled by a standard six-speed DSG. Volkswagen pioneered the use of small displacement, highly efficient direct-injection and turbocharged engines in the U.S., starting with the EA113 engine in the 2006 GTI and Jetta GLI. The 2015 Passat features a EA888 Gen 3 turbocharged and direct-injection four-cylinder engine that is made in Silao, Mexico. This 1.8-liter engine produces 170 horsepower and 184 pound-feet of torque, and posts gains of 1 mpg in EPA estimated highway fuel economy over the 2014 models. The EPA estimated fuel economy is 24 mpg city and 35 mpg highway when equipped with the five-speed manual transmission, and 24 mpg city and 36 mpg on the highway with the six-speed automatic. All-new diesel engine: The 2015 Passat TDI Clean Diesel is powered by the EA288 turbodiesel engine, Volkswagen’s all-new diesel engine family. The EA288 engine family is designated the modular diesel matrix, or MDB, and will form the basis for the majority of future U.S.-market Volkswagen diesel products. The EA288 in the Passat is a 2.0-liter, four-cylinder turbocharged and direct-injection diesel engine, a thorough update from the engine in the 2014 Passat TDI. Despite the similarity in basic specifications, the only aspect that carries over from the previous EA189 unit is the cylinder bore spacing. The new engine produces 150 horsepower—10 more than before—at 3,500 rpm, as well as 236 lb-ft of torque at 1,750 rpm. This high torque output is another compelling argument for diesel engines, along with their fuel efficiency. It delivers an EPA estimated fuel economy of 44 mpg on the highway when equipped with the six-speed manual transmission, giving a range of up to 814 miles on one tank of ultra-low-sulfur clean diesel. The compact EA288 engine has the intercooler for its turbocharger system integrated directly into the intake manifold, which serves a two-fold purpose of increasing throttle response and performance as well as helping lower emissions. The engine block is cast iron, with a forged steel crankshaft that runs in five main bearings and has four counterweights. In order to counteract engine vibration and maintain smooth operation, the EA288’s crankshaft is connected to two gear-driven counter-rotating balancer shafts that spin at twice engine speed. Friction has been reduced by about 15 percent in the engine, thanks to the use of roller bearings for the drivetrain side camshaft, increased piston-to-wall clearance, and lower piston-ring tension, among other measures. The aluminum-alloy crossflow cylinder head has a number of unique features. First, the camshafts are integrated into a separate housing by a thermal joining process, ensuring a very rigid camshaft bearing while keeping the weight low. Second, each overhead camshaft operates one intake valve and one exhaust valve per cylinder (as opposed to one camshaft for intake valves only and one for exhaust), allowing for greater air delivery and swirl. The engine features variable cam phasing on the intake and exhaust valves. 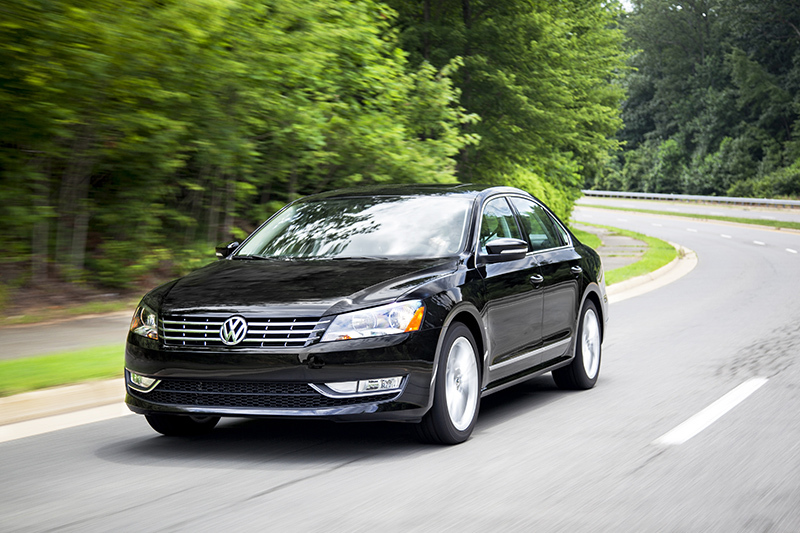 Optional on the Passat TDI Clean Diesel is Volkswagen’s DSG® six-speed automatic. This dual-clutch transmission is considered one the most-efficient automatics in the world. It incorporates a dual-clutch system that instantly engages and disengages gears without the need for a clutch pedal. With a special computer controlling the process, one clutch is engaged on the next gear, while the clutch from the previous gear is released. The Passat has been designed to feature the kind of dynamic, involved handling and precise steering that drivers have come to expect of a Volkswagen. Its front suspension features the proven Volkswagen formula of damper struts with robust lower control arms, coil springs, and an anti-roll bar. At the rear, there’s a sophisticated four-link independent layout with telescopic dampers and an anti-roll bar. The new electro-mechanical power steering is perfectly weighted to provide a balance between precision at highway speeds, and lower steering weight at parking speeds. Swinging into that tight, mall parking spot is easy, thanks to the Passat’s 36.4-foot turning radius and three turns lock-to-lock. Every 2015 Passat comes with Electronic Stability Control (ESC) that helps compensate for oversteer or understeer by applying individual corrective forces to each of the wheels. Also standard is an Anti-lock Braking System, Hydraulic Brake Assist, Tire Pressure Monitoring, and Volkswagen’s acclaimed Intelligent Crash Response System. In the event of a collision it automatically unlocks the doors, shuts off the fuel pump, and even turns on the hazard warning lights. The six standard airbags include front and side thorax airbags for the front-seat occupants, together with Side Curtain Protection® airbags front and rear. 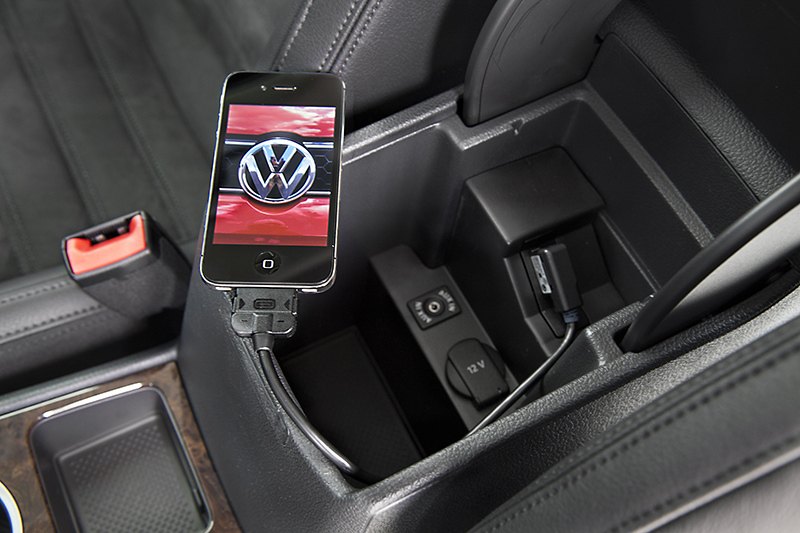 Peace of mind in owning a new Passat comes from Volkswagen’s no-charge Carefree Maintenance® Program. It covers scheduled maintenance for one year or 10,000 miles, whichever occurs first. 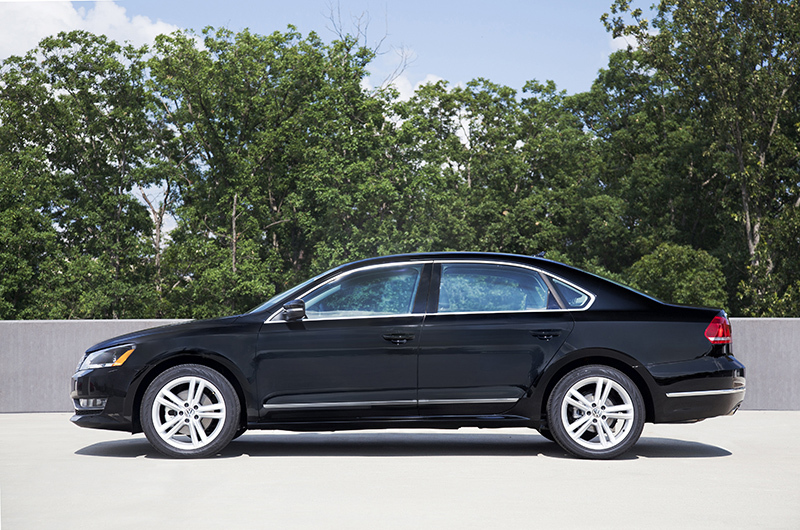 The Passat is offered in five trim levels—S, Wolfsburg Edition, SE, Sport, and SEL—with a total of 12equipment levels. All offer first-class safety and comfort. With pricing starting at $21,120 for the five-speed manual transmission model, its key features include: air-conditioning; hill hold control (manual transmission only); multifunction steering wheel with audio and phone controls; powered exterior mirrors; automatic headlights with “coming home” function; trip computer; RCD 310 radio with CD player and six speakers; aux-in; Bluetooth® technology; 60/40 split rear seat; lumbar for driver seat. The S is also available with a six-speed automatic transmission for $22,220. Priced from $24,135, the Wolfsburg Edition adds a six-speed automatic transmission; 16-inch “San Jose” alloy wheels with all-season tires; heatable front seats; V-Tex leatherette seating surfaces, power driver seat with power lumbar; VW Car-Net™ connected services; leather-wrapped steering wheel, shift knob and parking brake; SiriusXM® Satellite Radio; and a Media Device Interface (MDI) with iPod® cable. Starting at $26,020, this trim, equipped with a six-speed automatic transmission, builds on the features already offered in the Wolfsburg Edition with:17-inch “Sonoma” aluminum-alloy wheels with all-season tires; rearview camera; power driver seat and lumbar; highline instrumentation cluster with multifunction display; rear passenger air vents; leather-wrapped multifunction steering wheel with audio and phone controls; auto-dimming rearview mirror; power and heated exterior side mirrors; heated front washer nozzles; leather-wrapped hand brake and shift knob; Premium VIII touchscreen radio with six-CD in-dash changer and eight speakers. The SE with Sunroof and Navigation ($27,830) incorporates the RNS 315 navigation system, Keyless access with push-button start, chrome bumpers and door trim, comfort sport seats, and front foglights. Priced at $27,835, the Sport adds: a six-speed automatic transmission;19-inch “Luxor” aluminum-alloy wheels; a rear spoiler; foglights; a unique interior with sport comfort seats, carbon trim accents, aluminum sport pedals, paddle shifters (automatic transmission only), stainless steel door sills, and Sport-specific floor mats. Three exterior colors are available for the Sport: Urano Gray (an exclusive color for this model), Candy White, and Tungsten Silver. Candy White and Tungsten Silver are accompanied by a black roof and black mirror caps. A 1.8T Sport with five-speed manual is available for $26,635 as a sold-order vehicle. With a starting price of $31,475, this adds RNS 510 navigation; Fender Premium Audio System; remote start; partial leather seating surfaces; front foglights; rain-sensing windshield wipers; rear seat pass-through; driver seat memory; and eight-way power passenger seat. Opens at $26,825 and features a six-speed manual transmission; 17-inch “Sonoma” aluminum-alloy wheels; V-Tex leatherette seating surfaces; eight-way power driver seat; heated front seats; Premium VIII touchscreen radio; rearview camera; multifunction leather-wrapped steering wheel; VW Car-Net; sliding front center armrest; and rear passenger air vents. The SE with Sunroof ($28,840) adds a six-speed DSG dual-clutch automatic transmission, 18-inch “Bristol” wheels, and a power tilt and slide sunroof. The SE with Sunroof and Nav ($30,545) includes: side moldings with chrome accents, the RNS 315 navigation system, Keyless access with push-button start, comfort sport seats, and front foglights. This adds leather seating surfaces; comfort sport seats; rain-sensing windshield wipers; RNS 510 navigation; Fender Premium Audio System; driver seat memory; wood grain interior trim; and an eight-way power passenger seat. Starts at $33,585. This flagship model starts at $35,660 and adds to the SE equipment previously listed: six-speed DSG automatic transmission; foglights; 18-inch aluminum-alloy wheels; eight-way power driver and passenger seats; driver seat memory; partial leather seating surfaces; Keyless access with push-button start; RNS 510 navigation; Fender Premium Audio System; iPod cable; wood grain interior décor; interior chrome accents and chrome dual exhaust tips. Volkswagen’s Chattanooga plant that produces the Passat is part of a $7 billion investment by the company in the North American market (2014-2018). The facility was designed to keep environmental impact to a minimum and includes a revolutionary paint shop that significantly reduces emissions, and is the only automotive plant in the world to be certified Platinum in Leadership in Energy &Environmental Design (LEED) by the U.S. Green Building Council. A state-of-the art $40 million employee training center ensures adherence to Volkswagen’s exacting quality standards. Volkswagen will be investing a total of approximately US$900 million in the production of a newly developed, seven-passenger SUV, and creating 2,000 additional jobs in the US. About US$600 million will be invested in Tennessee, production of the new vehicle will start end of 2016. For more information go to:www.volkswagengroupamerica.com/chattanooga.